Smart Shopper Deal of the Day, scoring you 30-50% off at The Scott and Arizona Grand resorts! Check out these great resort deals! It was a BIG NIGHT with The Oscars, so we decided to score you a BIG DEAL! Scratch that, make it TWO exclusive, and massive staycation discounts just for you! Our Smart Shopper Deal of the Day offers you two resorts to choose from, or you can stay at both! 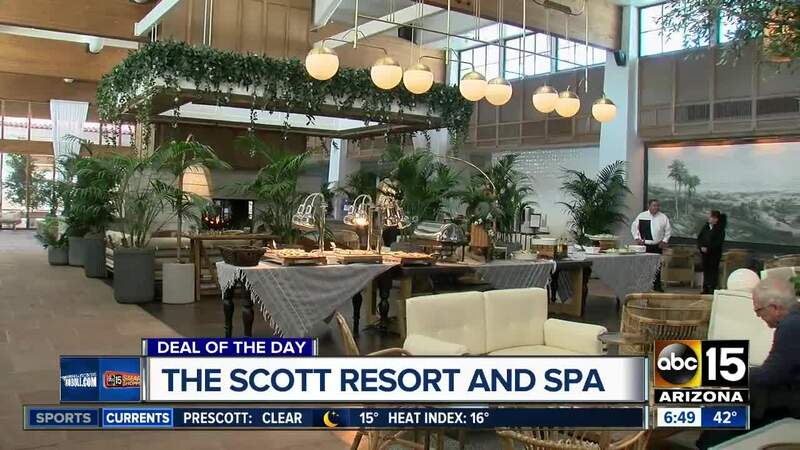 Let's start with The Scott Resort & Spa in downtown Scottsdale. The property is gorgeous from the lobby to the restaurant and bar, to the two luxurious pools, the spa and the rooms! It's a chic boutique stay that makes you feel like you're escaping the desert. If you'd rather stay at their sister resort, check this out! The Arizona Grand Resort & Spa is one of your favorites! Maybe it's the golfing nearby, the rooms, or the combination of the two, the spa, and the tropical Oasis Water Park! It's a great place for family fun! Get ready to stay at both for less with our Smart Shopper Deal of the Day! You will score 30-to-50 percent off your stay at both of these resorts! Either call and mention Smart Shopper or go online and enter the promo code, "ABC15". Or, to make it even easier, you can click here for a calendar of when the discounted rates are available for The Scott , or here for the Arizona Grand . When you click on the date you want, you will see what discount rate is available and can book directly there! You have until 11:59 p.m. Tuesday to score the deal, but you can book your stay through Labor Day for King or Queen/Queen room types. After the discount is applied, the prices start at $92! And, if you're staying at The Arizona Grand Resort & Spa, you get four wristbands per suite to the water park! Click here to see the hours of Oasis Water Park. The 30-to-50 percent discount is taken off standard "Flexible Leisure Rate" and does not apply to other discounted rates. The discount percentage and room availability are subject to change without notice. Blackout dates may apply. Here's a breakdown of the price ranges by resort and by month. Again, for The Scott Resort & Spa , click here to see a calendar of when the discounted rates are available. For the Arizona Grand Resort & Spa , click here to see a calendar of when the discounted rates are available. The week of March 24-28 (Spring Break for many), regular rate is around $339, so 50 percent off would be $169.50! In April, many dates are regularly $279, so 30 percent off would be $195, and 50 percent off would be $140. In May, many dates are regularly around $229, so so 50 percent off would be $115. Over the summer, the regular rates range from $184 to $199, so $92 or $100 with the discount. The week of March 24-28 (Spring Break for many), the regular rate is $399, so 50 percent off would be $199.50! In April (Easter Weekend), the regular rate is $299, so 50 percent off would be $149.50! The end of May, after the holiday, the rates drop to $189, and would be 50 percent off then as well.